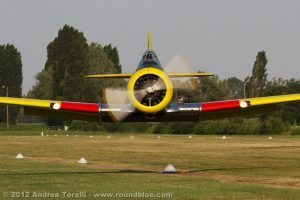 The North American Aviation T 6G brands I-SSEP, was “born” in 1944 as model D with c / n 121-41586 and s / n 44-80865. In 1951 it was updated to the G model, at the Columbus, Ohio plant with c / n 182-149 and s / n USAF 51-14462. After operating for about a year on Stallings basis, Kinston, North Carolina, was sold by the USAF, on behalf of MDAP (Mutual Defense Assistance Program), to A.M.I. assuming the MM 54101. Over the years, the aircraft has been reported with the codes AA-40 (Flight Training Center of the Aeronautical Academy), RM-11 (1st Air Region), RB-11 (3rd Air Region) and finally set aside at the Bari airport in 1976, before being alienated. Subsequently recovered in a theme park of Recanati as “scrap”, in January 1999 began the long and demanding restoration, which ended in December 2003 and on July 31, 2004 the first flight took place after a good 25 years of oblivion. 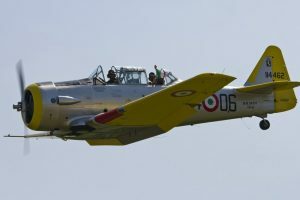 I-SSEP – The current livery adopted is that of a T-6C that operated in the 604th Squadron Links of the 4th Wing of Grosseto, in the years 50/60. The restoration team consists of the following specialists and pilots: Antonio Carluccio hydraulic / editor Domenico Scaccia motorist Giacomo Notarbartolo tinsmith / editor Luca Eusepi intelatore / pilot Sandro Pagliarin electromechanical / project manager / pilot Awards awarded: 04 September 2004 Carpi (MO) National Meeting of Popular Aviation Club First Special Award for Best Restoration of Historic Aircraft; June 13, 2009 Aeritalia (TO) World Air Games 2009 Gold Medal category Experimental aircraft – Restored. FlyParty Promo 2018 – HAG Italy from Michele Bacelle on Vimeo.